Simple or intricate, laser cut wedding invitations are a sure shot way to impress your wedding guests. These beautiful laser cut invitation cards suits work well for any wedding celebration and we know it very well that’s why we are offering a wide range of beautiful and elegant laser cut invites for all the lovely couples about to get married. In our elegant laser cut collection, you can find various designs, patterns and colors to choose from. You will find full-blown laser cut design wedding invitations to sweet subtle designs to choose from. 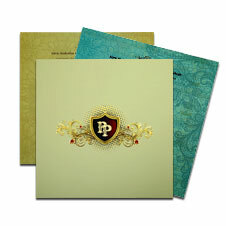 All our laser cut invites will leave you stunned with their grace and elegance. If you dream of having the most whimsical wedding invitation for your wedding then, you would find your pick here at 123WeddingCards for sure. Our expert designer team has artistically crafted all our laser cut cards India with superior quality and the wide range of variety. Once, you start browsing through our collection of laser cut invites, you will see all our marvelous creations. Moreover, you can browse our trendy foil stamped wedding invitations as we also offer amazing matching wedding stationery to suffice all your wedding invitations needs. Also experience the art of creation by indulging yourself with our fully customization facility. With the help of this, you can personalize your wedding invitation by adding your own wedding wordings, embarking the cards with your monograms and choosing your own colors and designs. 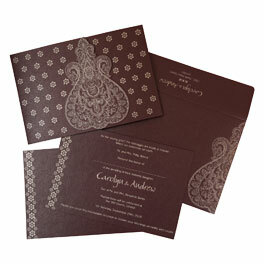 You will see the elegance like never before only in our collection of laser cut invitations and much more. If you still have any further query or suggestions, we are just a call away. Reach our customer support team 24x7 and we would be more than happy to help you!